Located onsite at Minstar's Eagan office, North Star Diesel is ready with six truck bays in its 6,000-square-foot service area. 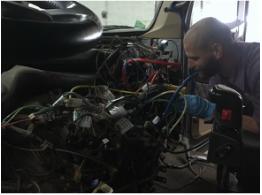 Well trained technicians and staff pride themselves in delivering quality service at an affordable price in a timely manner. When you stop, you will find a clean drivers lounge with free coffee and computer use including Internet access and Wi-Fi service. For your traveling comfort, showers, towels and a full laundry facility are available at no charge. 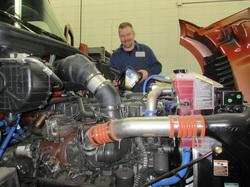 Roseau Diesel Service, located in Roseau, Minnesota, has been in business since 1968. 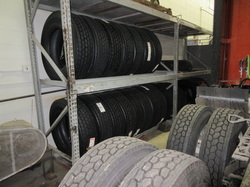 Equipped with three trailer bays and room for 5 tractors, they offer services for oil changes, preventative maintenance (PM), Federal and Minnesota equipment inspections, tire repair, truck & trailer alignments, and engine diagnostics for Cummins and Detroit engines. Roseau Diesel also has towing service available. In addition to their mechanical services, Roseau Diesel also has free showers available.